Starting from the object-level source code for a database, Phil Factor shows how SCA can create a NuGet build package, use it to migrate target database to the same version, and publish web-based database documentation, a report of what changed on the target and the results of a static code analysis assessment. 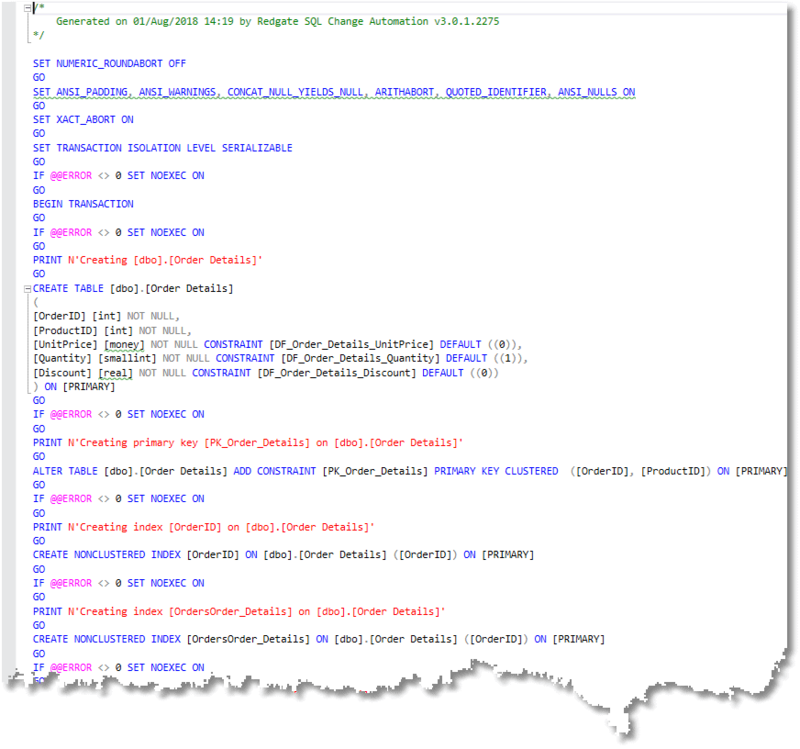 This article uses the PowerShell cmdlets of SQL Change Automation (SCA), formerly DLM-Automation, to take the source code of a database from a directory, validate it, document it and then create a NuGet package of it. Up to this point, the script uses a very similar approach to that described in SQL Change Automation with PowerShell Scripts and Deploying Multiple Databases from Source Control using SQL Change Automation. In these previous articles, we simply placed the validated database source and the documentation into a NuGet package and used the Sync-DatabaseSchema to synchronize the schema of a target database with the validated source and saved the migration script that was generated to the same directory in which we stored the NuGet package. Extract the documentation from the NuGet package, and install it in a website. 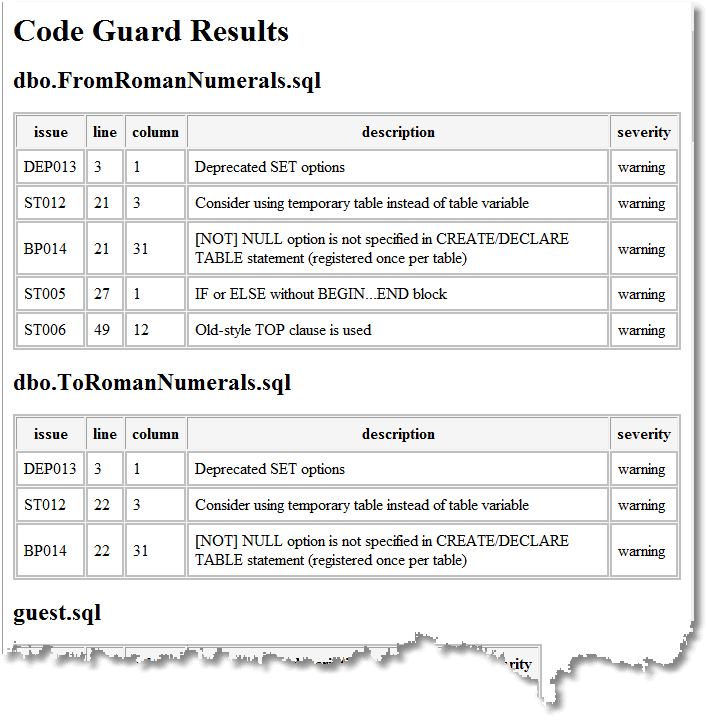 Perform code analysis of the validated source, using the command-line version of SQL Code Guard, and display a report that lists all the problems in the code, and their locations, as an HTML page. Use the NuGet package as a Source, to produce a migration script, and then use it to upgrade a target database to the same version as the one defined by the NuGet package. Save the migration script, and a browser-based report of what has changed on the target machine. This article, along with the previous two, are designed to make it easy to put together a script for special purposes. For a full explanation of some of the more utilitarian parts of the script, please refer to the previous articles. Before we start, a word about NuGet. A NuGet package is a single ZIP file, with the .nupkg extension, the contents of which must follow certain conventions. A NuGet package generally contains compiled code (DLLs) as well as other files related to that code. It also holds a descriptive XML manifest (a .nupsec file), for information such as the package ID (the database name in this case) , version number (e.g. 1.0.1) and author. For security reasons, NuGet packages must be signed, and a signed package must be immutable, including the manifest. So, while it’s easy to read the contents of an existing NuGet package, you can’t change those contents without invalidating the package signatures. SCA uses the NuGet format for storing the source code, or metadata, of a database, as a ‘SCA artefact’. This allows database developers to have the choice of hosting versions of database code, either privately in the cloud, for workflow systems such as Visual Studio Team Services, or on a private network, or on a package server. 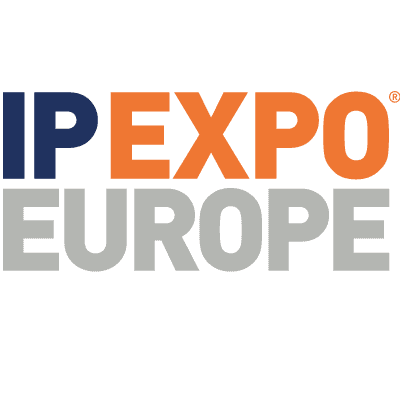 It allows packages to be made available only to a specific group of consumers. Although zip files can be encrypted with AES-256 encryption, the NuGet convention has no common standard for doing so. This prevents any sort of sensitive data being stored in a NuGet package and means that great care is needed in publishing a NuGet package to make sure that the database code is not distributed beyond those needing access to it. Currently, SCA can add the documentation of a database to the NuGet package, but no more than that. As the documentation is about the database code, this makes sense. After all, it is designed to be just a database metadata package. 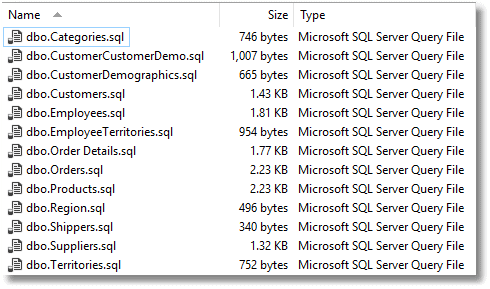 If you need more than that, it is probably better to create a second NuGet artifact file for such things as data, scheduled SQL Agent tasks, SSIS projects, PowerShell scripts, R packages and so on. Since a NuGet package is just a ZIP file, with a .nupkg extension, it is very easy to create one. The simplest approach would be to create the folder structure on your local file system, then create the .nuspec file directly from that structure, using wildcard specifications. Nuget.exe’s pack command then automatically adds all files from the nuspec file, other than folders that begin with a dot. This means that you don’t have to specify in the manifest all the files that you want to include in the package, so you can liberally add all the files that are needed. In this demonstration, we will use the good old NorthWind database, the source of which is in a directory. Less visible as an end-product is a NuGet package that can be used subsequently with SCA PowerShell cmdlets to deploy (‘Publish’) the database as many times as required. The PowerShell script is well documented, so I’m going to present it without too much elaboration. It uses a Hashtable, $config, to store the configuration data. This gives us some versatility, especially when updating many target databases, as we can iterate through the hashtable. It also separates the data from the process. We need some variables to create the config hashtable, but this is just for convenience. You have quite a lot of choices in how you deal with such things as databases and file locations since you can alter them at the level of the hashtable or the initial variables that are used in its construction. Every site has its own naming conventions. # so if $WorkDirectory was "$($env:HOMEPATH)\SQL\Databases"
# the project might be in "$($env:HOMEPATH)\SQL\Databases\AdventureWorks"
# the source might be in "$($env:HOMEPATH)\SQL\Databases\AdventureWorks\source"
# source code directory even as a subdirectory, because it gets treated as source code! # The directory to store the NuGet Package in. # The directory to extract the NuGet Package from. # The directory store spcific deployment materials. # The directory for the documentation site. # The directory for the CodeGuard results. # The directory to store the log in. # now we check that directories that need to be there really are. $Errors += "The project file directory for $($config. 'PackageId'),'$($_)' isn't there"
<# This is more elaborate a process than you might expect because we can't assume that we can use Windows authentication, because of Azure, remote servers outside the domain, and other such complications. We can't ever keep passwords for SQL Server authentication as part of the static script data. At this stage, we ask for passwords if they aren't known, and otherwise store them as secure strings on file in the user area, protected by the workstation security. if ($Errors.count -eq 0) #if there were errors, then it gives up at this stage and reports the errors. $Errors += "$($Database.Name;) of $($config. 'PackageId') couldn't be validated because $($_.Exception.Message)"
$Errors += "$($config.PackageId) could not be verified." $Errors += "$($config.PackageId) could not be documented." $Errors += "$($config.PackageId) build Artifact could not be created." $Errors += "$($config.BuildArtifact) couldn't be exported because $($_.Exception.Message)"
So, that is it. Remember, that this is just for demonstrating the PowerShell processes and not everything is done to production standards. Note that the system is versatile. For example, where the change, or migration, script needs to be checked and amended, before being executed on the target database, you would need to get signoff for the change script in $update.UpdateSql before the Use-DatabaseReleaseArtifact cmdlet is executed. It is likely that every server would have a different change script, depending on the metadata, so this would have to be done on every target of a deployment that needed a signoff. $where="pathToDirectory" #fill this in of course. The use of a NuGet file merely as a read-only container of files comes as a slight shock to the seasoned database developer, especially when one is used to all the wonders of Chocolatey. However, it makes sense to have this for the database metadata and its documentation, especially when the database is a full participant in an application development process, using applications such as TFS, and deploying to cloud and remote servers. However, the seasoned database developer will still be wondering about all the extras such as scheduled jobs, alerts and ETL. In SCA culture, this is kept very separate because there is no common way of handling them. To show how to create separate NuGet packages for extra bits will be a topic for a future article. 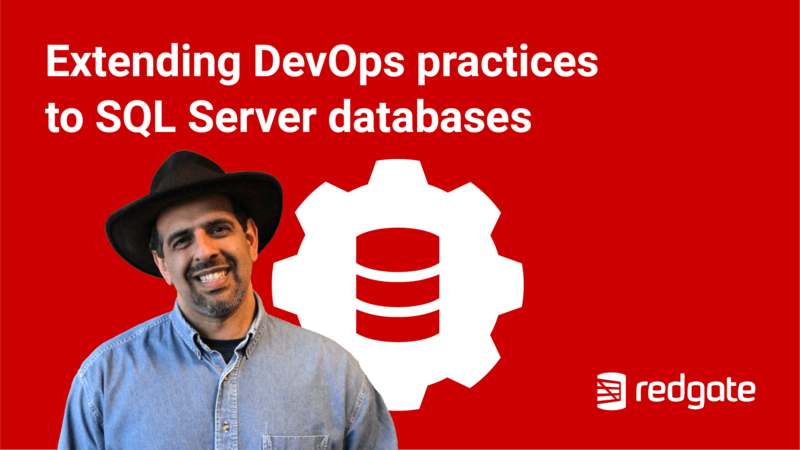 Join Microsoft Data Platform MVP, Steve Jones, to learn how Redgate’s Database DevOps solution works to improve your database development processes. 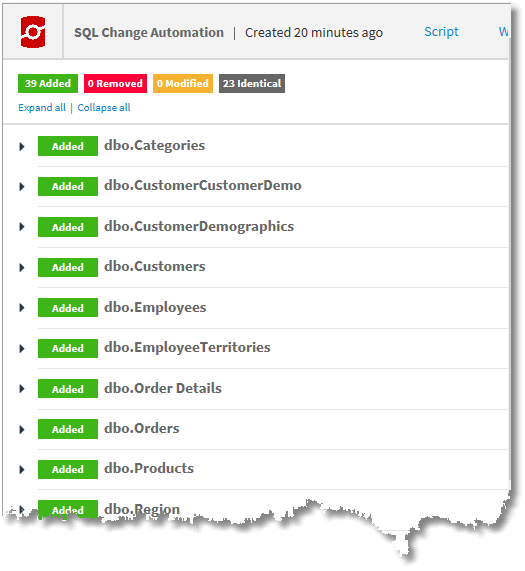 For the SQL Change Automation team, it’s important that we take time out from development, occasionally, to explore some of the issues our customers face when automating database deployment. Following on from previous posts about cross-database and cross-server dependencies and production database drift, this article shares some of our thoughts about how to deal with database replication. 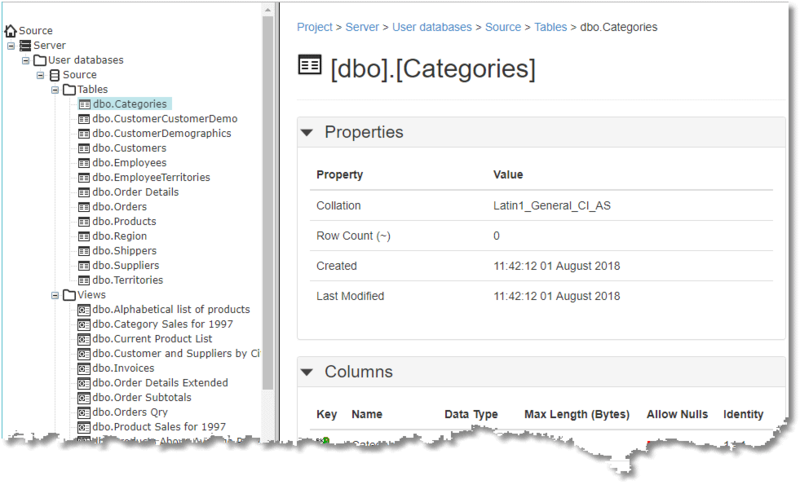 In the SQL Source Control course, you can learn how to capture database changes, add them to a source control repository and make manual deployments. This course will take you a step further and show you how to use SQL Change Automation alongside SQL Source Control to introduce automation into your pipeline. SQL Source Control uses a state-based approach. If you’re interested in learning more about a migrations approach, then see the SQL Change Automation with Migrations course. in the last several lines of your script? I’ve got stuck at that point where the powershell console complains about the syntax error as below. path was included, verify that the path is correct and try again. Thanks, Chad; I’m also grateful for you for pointing out a place where WordPress has taken a vengeance on my article. I’ve asked Redgate to remove both of them. In the meantime, you can safely take them both out of the script and the PowerShell will run a lot better without.